And here we are again. In the midst of parties, shopping, wrapping and whatnot, we routinely decide to bake ungodly amounts of cookies in those two free hours that one Tuesday night. Why do we do this to ourselves? I know why; we all know why, so let’s make this easy on ourselves. 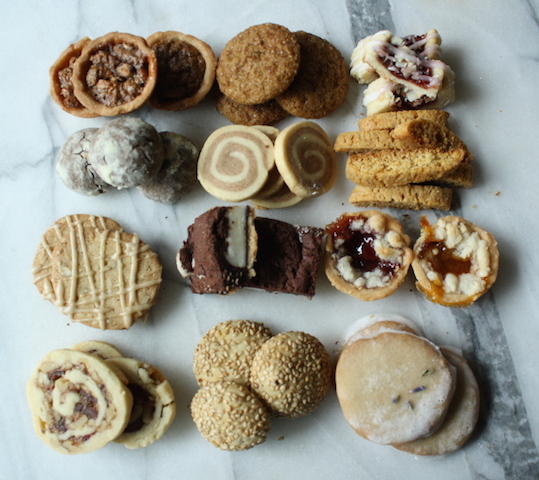 For the third year, I’ve got the solution to your holiday baking stress: twelve completely different cookies from one basic butter cookie dough. Make a batch, or two, divide it up and flavor it a bunch of different ways. In the weeks that follow, I’ll give you twelve new recipes or you can use any of the twelve from last year or the twelve from the year before (listed below). By the end of December, that will be 36 possible variations to this basic recipe. Not too shabby! For most recipes, I’ll give you the option of making a big batch (from half the dough), a medium batch (from ¼ of the dough) or a small batch (from 1/8 of the dough). Pick and choose as you see fit. I’ve posted this primer before but think it bears repeating before you get started. GET ORGANIZED: First and foremost, decide what you’re going to make and how much. Determine who’s on your cookie list. Be cold hearted about it. You put a lot of time into this, make sure your recipients are worthy. (I once gave a box to a chef I worked for, who promptly put them in the break room. Off the list. I don’t mess around.) I am a list maker and throw everything on an excel spreadsheet – what cookies I’m going to make, who’s on the gift list, batch yields, quantity per box, shopping lists, baking plans. By keeping batch counts every year, I have some pretty accurate projections and know exactly how many I need to make. It works for me … find your system. DIVIDE AND CONQUER: Remember, you don’t have to do a batch start to finish all at once. Most doughs freeze beautifully so make it weeks ahead, freeze and bake later. I greatly prefer to freeze dough rather than baked cookies – takes up less space and the end product tastes far better. I shoot to have all my doughs done and in the freezer by Thanksgiving weekend. That doesn’t always happen but it’s good to have goals. In a perfect world, my friends, in a perfect world. THINK ABOUT YOUR RECIPES: From both a flavor and a visual perspective, aim toward a good mix of textures, colors and flavors. Get your bases covered – chocolate, nut, spice, fruit (citrus and dried fruits) and vanilla. Think about your textures – crisp, soft, filled. The last thing you want after putting in all this effort is a monochromatic box full of the same flavors. Fifty shades of beige is not a happy box. OVERALL PRESENTATION: Christmas cookies are special – they should be pretty and wonderful, unique and interesting. Mix up your shapes – round, square, triangles. Do a few fancy cut-outs. Work in some different finishes – large grain sugar, glazes, crushed nuts, sprinkles or fancy pants royal icing work. Fill a few with caramel, ganache or jam for some tasty sandwich cookies or thumbprints. But think special – this is not really the place for your everyday cookie. I’m just going to say it: I don’t care how great your chocolate chip cookie recipe is; it is not is a Christmas cookie. 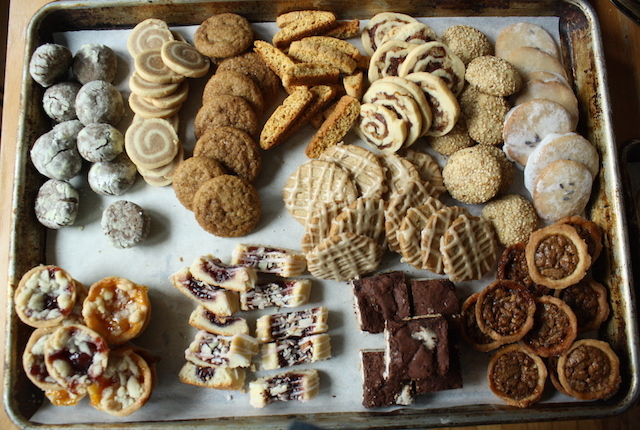 WORKHORSES: Make the bulk of your cookies easy to produce – bar cookies, brownies, shortbread and my favorite, slice & bake logs. If you make bars in quarter sheet pans rather than 9”×9” pans, they’re much thinner and cut very elegantly. For a different look, cut thin rectangles or triangles rather than the usual squares. For slice & bake logs, think beyond round. Dough logs can easily be formed into squares or triangles too. 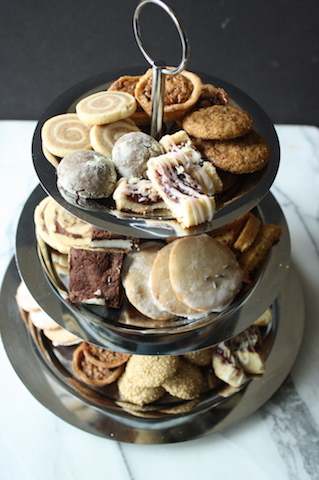 SHOWSHOPPERS: Work in a few, just a few, really fancy cookies. These can be checkerboards, detailed cut-outs or windowpane types like linzer. What you’ll do is fill the box with the “workhorses” and put just a few of these pretty ones on top. As the box is opened, the recipients will see the pretty ones first and it’ll set the right “ooooooh!” tone. One year, just once, I made gingerbread gift tags for the top of the boxes with really fantastic icing work. I must have been unemployed that year. 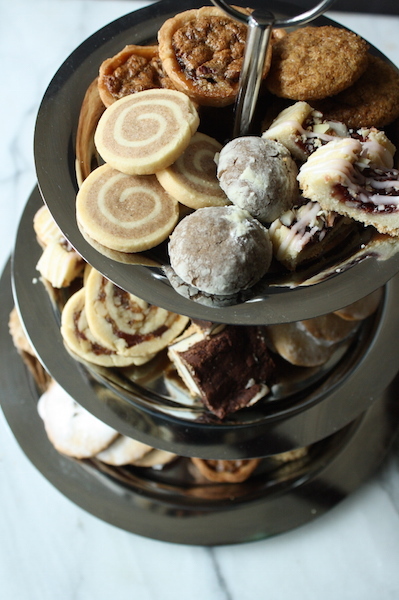 ONE DOUGH, MANY COOKIES: This is my biggest holiday cookie trick. I’ll make a big batch of butter cookie dough, divide it into a few portions and flavor them differently. With a minimal amount of effort I can have several completely different cookies in no time. It’s a lot easier to flavor one dough four ways than to make four different doughs from start to finish. And that’s what I’ll be doing for the next twelve posts. Today it’s the basic butter cookie dough recipe to get you started and then The Twelve Days of Cookies starts on 12/1, and every 2-3 days will post a new variation for a new cookie. By the end, you’ll have a pretty great cookie plate. If vanilla is out of your price range, bourbon or dark rum makes a nice if not quite as flavorful substitution. In a standing mixture fitted with the paddle attachment, cream butter, sugar and salt until light and fluffy, about 3-4 minutes. Scrape the bowl and with the mixer running on medium-low, add the yolks one at a time, then vanilla and beat until incorporated. Scrape the bowl. With the mixer on low, gradually mix in the flour until combined. Scrape a final time and turn the dough onto a work surface and gently knead to incorporate all remaining flour. Divide the dough into two, four or eight equal pieces and use as is for a delicious butter cookie or proceed with one or several of the variations that will follow in the next twelve posts (or the twelve posts from last year). If you have a scale, use it to divide the dough into precise measures. Dough can be made ahead and refrigerated, tightly wrapped, for 3 days or frozen for up to 2 months. Let return to room temperature before continuing. If using salted butter rather than unsalted, decrease the salt in the recipe to ¾ teaspoon.